The other day we had a little snow … not much to speak of… it did not cover the roadways or cause any traffic problems… but it was pretty snow none the less. It came down in the big, wet, sloppy, gobs of snow that cling to the trees and plant life. 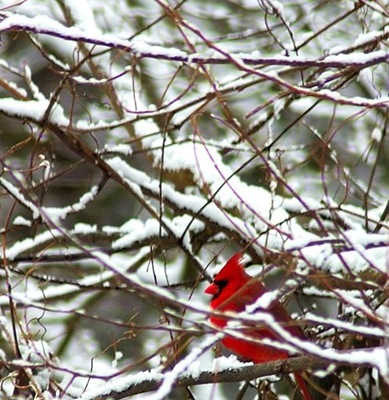 My friend caught this beautiful cardinal out in the wood line behind her house and I thought I would share the picture with everyone. It finally snowed in Louisville. As it seems that we have had consistent cold this winter, I am finding it hard to believe that we are actually having climate change. I can’t seem to feel warm this winter… and trying to cut back to save money by not heating my home as warm as I like it sure makes the joints hurt.